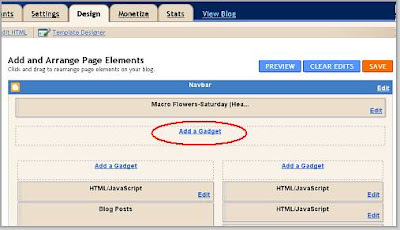 This tutorial explains how to add external links (non pages links) to the page list menu. Using the new Blogger interface, we have now the possibility to add external links to our page list menu, keeping the styling of our current template. At the time I wrote this tutorial this was not possible with the default page list widget, so I updated this tutorial to reflect the new possibilities. To accomplish this you have to use the new Blogger interface. Step 1. From your dashboard select the blog you want to work with, click on the dropdown menu at the right and select pages, as shown in the picture. Step 2. From the new page that opens, click the dropdown menu near New page and select the second option (Web Address). Follow the required steps and you are done here. If you still want to create a custom menu for your Blogger blog, read bellow how to do it, for both, new designer templates and older, layout templates in the second part. Update: when I wrote this tutorial, it was not possible to add external links to the default menu (Pages) list. If you still want to add a simple list of links instead of the pages widget, please read along. Save this list in a text editor (Notepad), for later use. Important! If you already have the page list widget installed, hide it. To do this just go to Dashboard/Pages and from the dropdown menu at the right, select don't show (as in the picture). There will be no other widgets in this section, now that the default menu is hidden, but it's styling is still in the template and we will make use of it. Step 4. Copy and paste into the widget box the linklist you've saved in step 1. Step 5.Save the widget and preview. Check if the widget is in the right place (the red oval in the image), if not, drag it to the crosscol section (under header). You should see now your new menu, with all your links, and the styling of the old pages list. That's it, if you like the look of your menu, we are done. For further customization and styling of the tabs background or tabs text color click the link. The difference between the two templates is that layout templates don't have styling for the Pagelist menu background or tabs. Layout templates are relatively old templates and there tons of tutorials on the web about creating a custom menu, still I wanted to include this one too, here. Creating a custom menu you can add to it all the link you want to show in the menu, non-pages links too. As an example, we'll use the styling of the menu you see on this blog (width: 950px); it is not very fancy but if you are more patient than I am, you can change it. Step 1. Give your menu a unique ID, like #main-menu, you can name it however you want. - You can change any value in this code to your liking. - Copy the code first into a text editor (Notepad), if you think you need more time to make your changes. Step 3. After making all the changes copy you customized CSS code from the text editor and paste it in your template, right above ]]></b:skin>. Step 4. Save your template; at this moment you can't see the changes, you still need the link list. - before you save the widget, make sure you've deleted the default pagelist widget (as in step 2. for designer templates) , otherwise you will end up with two menus. - Save the widget and see your new menu. - There are also many online menu generator, just google for them. For customizing the default pages menu read this post. - replace the "no"in red with yes. If you don't have one of the above codes in your template, you have to insert it, usually after <div id='content-wrapper'>, or where you want the tabs to show up. Which one to insert? That depends on your template. hey this is super helpful, but my only problem is it comes out as a bulleted list. How can I make it go across the page. I did the first option. JisForJinx, you have a layout template, so you have to do the second option. In case you use the code from my example, note that its width is 950px and yours is 960px. Also, you are using the default widget page list, so you should read this post too. Thanks for this tutorial, I'm so close to getting the effect I desire, but not quite there. I have added images and links trying to create a navbar, but they are stacking instead of being in a row horizontal. Any suggestions? - if you are not sure of the answer, I need a blog url and I can't take it from an unavailable profile. Thanks, I didn't realize my profile had been made unavailable! It is available now. I started out with Minima Lefty Stretch, but have made many tweaks since then. I applied the "Custom menu for Designer templates" method, and it almost worked perfectly for me, I just can't figure out how to make the images not be stacking, but instead in a horizontal row. All Minima templates are Layout templates, so you have to apply the second method: Custom menu for layout templates. Follow the tutorial and probably it will work this time. If not, let me know and I'll try to fix it, but only tomorrow (my tomorrow); it is 0:40 AM at my clock. I tried this and it works great but I'm trying to get another result. Each link being replaced by a graphic that says "home" "contact me" etc. instead of just the plain lettering. Hopefully I'm being clear. Do you know of a way to do this? I've seen it on someone elses blog...and I can't seem to find a tutorial on it anywhere. Maybe I'm looking in the wrong places? Can you help me out with that? 1. Create your images an upload them to an image host, note their URL. 2. Follow the steps form 2.1. - change width, border, padding, according to your images. - do this for all your tabs with the corresponding image. This may not work well in designer templates with your existing page menu styling. it worked great! thanks so much for your help, you have no idea how happy you've made me today hah I was wracking my brain for hours yesterday! I'm glad I could help. To make someone happy is the greatest satisfaction. For new templates go to Template designer|Advanced|Tabs text and choose a different text size. Change the 14px as you wish.